“Pope Francis in His Own Words,” edited by Julie Schwietert Collazo and Lisa Rogak. New World Library (Novato, Calif., 2013). 137 pp., $12.95. “Pope Francis” by Matthew E. Bunson. Our Sunday Visitor, (Huntington, Ind., 2013). 222 pp., $16.95. 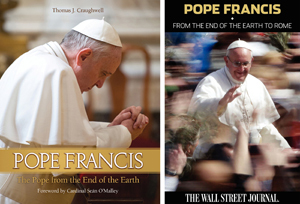 “Pope Francis: The Pope from the End of the Earth” by Thomas J. Craughwell (St. Benedict Press, 2013). 175 pp., $22.95. “Pope Francis: From the End of the Earth to Rome” by the staff of the Wall Street Journal. HarperCollins Publishers (New York, 2013). 185 pp., $6.99. “A Call to Serve: Pope Francis and the Catholic Future” by Stefan von Kempis and Philip F. Lawler. Crossroad Publishing (Chestnut Ridge, N.Y., 2013). 157 pp., $16.95. One has no difficulty imagining the frantic flurry of activity in the offices of publishers following the appearance, on March 13 of Pope Francis as the new leader of the world’s more than 1.2 billion Catholics. A quick online search indicates that more than 400 books about Pope Francis have appeared in print, in English alone, since his election. There doesn’t yet, however, seem to be a thorough biography of Pope Francis. Among these five books, “Pope Francis,” by Matthew Bunson, is a journalist’s and church historian’s detailed discussion of events surrounding the new pope’s election, from the resignation of his predecessor, Pope Benedict XVI, to the installation of the former Cardinal Jose Mario Bergoglio, of Argentina, as the first Pope Francis. You also get 16 pages of color photos. Thomas Craughwell’s “Pope Francis: The Pope from the End of the Earth” comes closest to being an actual biography of Pope Francis, albeit a sketchy one. The only hardback book of the five, Craughwell’s is admirably well-researched and readable to the point of being an entertaining and informative page-turner. You also get dozens of photos. The sole book among these five that seems to be available only as an e-book, “Pope Francis: From the End of the Earth to Rome,” is journalistic in style — not surprising given that it was written by scribes from The Wall Street Journal — but more in-depth than you would get from typical newspaper articles. This is a remarkably thorough look at the new pope’s personal history, his years as a Jesuit priest in Argentina, and the years, months, weeks and hours that led up to his election as Pope Francis. “A Call to Serve,” by Stefan von Kempis and Philip F. Lawler, also covers events leading to the appearance of Pope Francis before the crowds in St. Peter’s Square, and it describes the surprising and refreshingly humble style of the new pope that became evident in the first weeks following his installation. Again, this book provides numerous photos. A note in the front of the book declares that its text was finalized on April 3, 2013, less than a month after the election of Pope Francis, so this was one expeditious publishing project. All five of these books, each in its unique way, is informative and inspiring. This reviewer’s advice: If you can, read them all. Also of interest: “Pope Francis: The Vicar of Christ, From St. Peter to Today” by the editors of Life. Time Home Entertainment (New York, 2013). e-book, $12.99. Hardcover $17.95. Finley is the author of more than 30 books on topics of interest to Catholic readers, including a bestseller, “The Rosary Handbook: A Guide for Newcomers, Old-Timers, and Those In Between” (The Word Among Us Press). 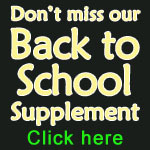 To learn more, visit www.mitchandkathyfinley.com.